UPDATED: Thu., Feb. 2, 2017, 5:59 p.m.
Alex Mowbray’s Western Hockey League career was resurrected with one unexpected phone call. 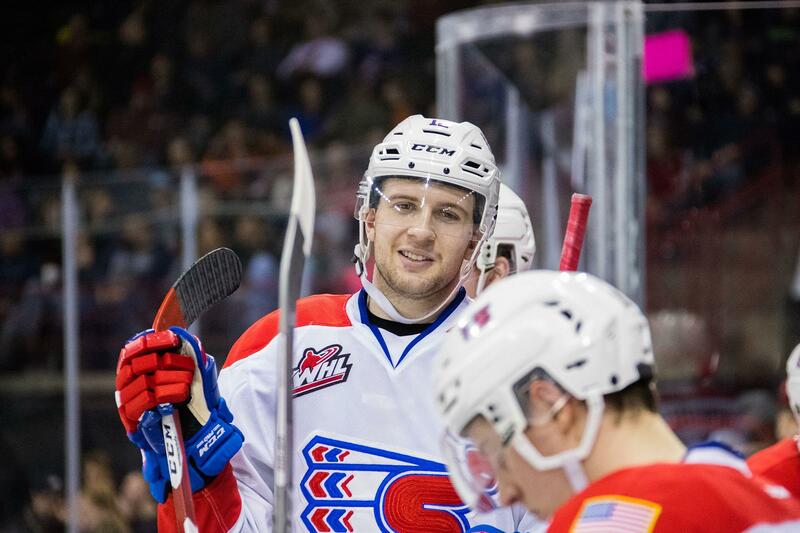 Mowbray, a 20-year-old forward signed by the Spokane Chiefs in late December, received the Dec. 23 phone call from Spokane general manager Scott Carter while at his Grandfather’s house in Ponoka, Alberta, 45 minutes south of Edmonton. Carter asked about Mowbray’s interest in coming back to the WHL and signing a contract with the Chiefs during the call. Mowbray hung up the phone in shock. “It was a pretty great Christmas present,” Mowbray said. After being cut by Medicine Hat before the season, Mowbray was playing with the Camrose Kodiaks in the Alberta Junior Hockey League, a step down from the WHL. He scored 20 points in 32 games for the Kodiaks. The biggest adjustment since returning to the WHL is adapting to the speed. “My first game in Seattle, (the speed) felt pretty ridiculous,” Mowbray said. “It felt like someone was on me pretty quick. Mowbray eagerness to help the team has been noticed by coach Don Nachbaur. Before Mowbray’s arrival, the Chiefs penalty kill was reeling. The Chiefs were allowing goals on 40.5 percent of opponent’s power plays, a very high clip. Now the Chiefs are allowing goals on 19.2 percent of opponent power play opportunities. Players returning from injury and overall improved play are also factors, but Mowbray’s presence has given the Chiefs a boost. His defensive responsibility also allows many of the younger players on his line – particular Pavel Kousal and Ondrei Najman – more freedom. The Chiefs play Medicine Hat on Friday at the Arena, giving Mowbray a chance to face-off with his former team that released him because of the over-age player restrictions. With four players vying for three potential spots, Mowbray was the odd man out. The Tigers, second in the Eastern Conference with 57 points, travel to Spokane with a cast of familiar faces for Mowbray, many he keeps in touch with. Mowbray said he’s excited to reconnect with his former teammates, but he knows it won’t be a heartfelt reunion. Nobody is friends on the ice, he said. “I’m going to take a lot of abuse, I know that,” Mowbray joked. “They’re going to say some things that I obviously have to not think about. Published: Feb. 2, 2017, 11:42 a.m. Updated: Feb. 2, 2017, 5:59 p.m.